With a mostly refined and complete list in tow, I finally felt confident enough to bring Elves to a daily yesterday. The matchups were R/G Tron, a strange U/B Merfolk list, Grixis Delver, and Affinity. See what happened in the video below. After testing more since last time, I’ve decided to drop the number of Chord of Calling to two, as I was missing too often on Collected Company (also Chord can be awkward sometimes), replacing it with a Fauna Shaman to maintain consistency. Nykthos and Cavern counts I’m not settled on yet, but after being screwed on Chord by Cavern a few times, and not being able to go off turn 2 with Heritage Druid because of Nykthos a few times, I’ve tentatively dropped both to 2 each. Definitely running more Cavern in the board is an option (we’d swap Nykthos out for 1-2 more) — I may try that in the future. I’m not big on Dismember but it might be necessary. For now at least, it’s just a placeholder for Spellskite. Root Maze is the “techy” card, which I think has a lot of potential against 3+ colour decks. Originally I thought Affinity as well, but after thinking about it more, it’s mostly only good turn 1 on the play — too situational. In any case, I’ve heard good things about Maze before from other Elves players. This could very well stay and maybe even see more copies, depending on results. Scattershot Archer seems very solid (it pretty much won an Affinity game for me on its own), and against the decks I want him for (mainly Affinity and Abzan), they are likely to kill the first copy, and 2 out lets me kill Ornithopter, so for now I’m going to bump him up to 2. The 4 Sage plan, while great sometimes, probably isn’t optimal. I’m going to swap some out for Fracturing Gust. I like Creeping Corrosion because you have a higher chance at dropping it after a Whipflare, unlike Gust. However, Gust also works great against Auras and random decks that rely on enchantments (like Enchantress, and that Form of the Dragon deck), gains life, and is instant speed (which we love). One Sage should remain because it makes a great tutor target in a variety of matchups, and versus Affinity, hitting it off Company is always welcome. Spellskite is great at protecting Ezuri. I am going to build this for Modern next week minus the caverns (hate to drop $50 on something just for fun). Hopefully laughs will be had. It may be worth uploading the replay of the latter three matches. The dailies with these decks are very interesting, but the last three are very awkward to watch with no commentary. Replays would basically be a faster way to show what you did in them. Very true. I’ll get on it now. Done! There’s commentary as well. Awesome! Thanks a lot for putting the effort in, both in brewing and actual testing. It’s really interesting stuff. It’s very enlightening to get some insight into how you’re thinking as well, enjoyable here and on your earlier 8rack dailies. Thanks very much. Glad you’re enjoying it. I have not personally tested with this deck, but I do find it very interesting and will probably start doing some testing myself. I have been following the occasional threads about this deck on the reddit forum /r/spikes and their discussion of the deck. Specifically this thread http://www.reddit.com/r/spikes/comments/310fv7/modern_collectcall_update_matchups/ . In this thread, the author is pretty adamant that devoted druid does not belong in this deck. It the potential to combo is so rare, and when it does come up, it is often overkill. What are your thoughts on Devoted druid? Some times he lets you attack for infinite, but how many times is infinite damage a kill that just one pump wouldn’t be? He says in a later post he was probably too hard on Druid. There we discuss the differences between our decks and agree they’re both good and basically just down to play style. Devoted does so much more than just function as a combo piece — that it does is really just icing on the cake. There have been a fair amount of situations where it’s a kill where otherwise it wouldn’t be, either because it’s infinite or because I can tap it for two or three mana (with Archdruid). It also synergizes extremely well with Chord, Company, Heritage, Nettle, etc (many times I will cast a Chord or Company for “free” or even net mana because of it), and provides some very nice value with Ezuri — many times I will overrun, then untap Druid to regenerate an elf or three. Sometimes I will tap her and maybe other sources for a bunch and double overrun. Lots of applications. Nice deck, I didn’t know elves were still about, but it looks really fast and capable of competing, obviously collected company pushes it further than previously. Really nice stream, and I like the fast matches at the end – it’s tonnes better than watching a full 4 rounds for 3 hours (I mean, I hardlt have time to play 4 rounds never mind watch them)! Good work. The first match you played against was this deck from Caleb at Channel Fireball – you didn’t play against him, just his brew (or potentially someone elses brew that he was show-casing). Either way, knowing the list and the thought process behind it may well help you with your further matches! Yeah I like the faster speed but most people seem to prefer live commentary. I’m happy to do just replays with commentary though if that’s what most of you guys want. Thanks. I like Caleb’s work, and I’ll check out the article, although I doubt it’ll change my impressions of the deck much, if at all. I need a help, wich splash for sideboard would you pick? Black for Thoughseize , Abrupt Decay and maybe Golgari charm. Red for Rending Volley, Blood Moon, Ancient Grudge and maybe Magus of the Moon. White for Leyline of Sanctity, Dromoka’s Command and maybe Path to exile. Blue for Spell Pierce, Swan Song and maybe Condescend. Any other ideas? I am choosing mine and my doubt is between Black or Red. Personally I love red with Magus. In the right meta (and it could well be this one), it has the potential to be insane. I’ll test it at some point. I know of a guy that tested it and it worked great for him. 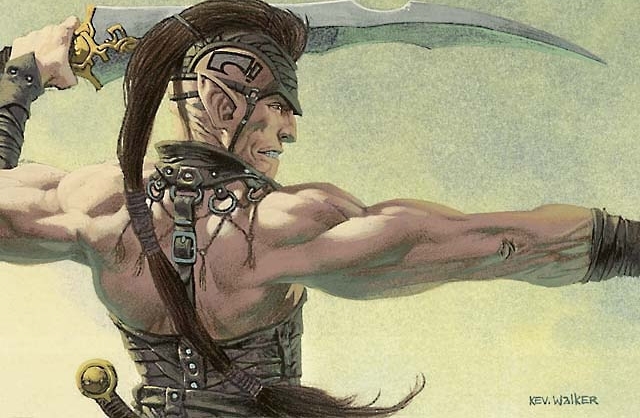 I’m skeptical of Thoughtseize in Modern Elves; I don’t think we need it. Maybe a grindy version could be good, but it seems strange to me. Maybe it’s just a playstyle preference. I think you’re making the mistake of splashing for every good card in a given colour. What’s best in other decks is not necessarily best in ours. Also, Command doesn’t do much for us. Would be good in a full-on aggro version, though. You do NOT want to hold up mana for counterspells with this deck, trust me. The only problem with magus is that it dies to Pyroclasm and Anger of the goods and both of these spells need only red mana to cast… But against 3 colored decks that dont use pyro or anger , Magus is insane cause it can be easily tutored with Collected or Chord. Rending Volley, Blood Moon, Ancient Grudge, Magus of the Moon, do you remember of anything else? Dromoka’s command kills Eidolon of great revel, shuts down pyroclasm and anger, and can also kill a threat against Infect. To choose the best splash colour we must define our hardest matchups. Magus is mainly for Junk, Amulet, and Infect. Pretty impressed with how Elves did in this daily, and I agree with most of your changes. That said, how do you feel about sneaking 1-2 Scattershot Archers into the mainboard? They do a lot of work against cards like Lingering Souls, Spectral Procession, Blinkmoth/Inkmoth Nexus, Vendilion Clique, Pestermite and can stuff 1-power attackers (like a T1 Swiftspear), and that basically covers all of Modern’s Tier 1 decks. I think it’s at least worth testing. I 3-1’d again today, and probably could’ve 4-0’d if it weren’t for a misplay. Archer is dead in a lot of matchups and not vital in some of the ones it’s good in, so, I don’t like it main.